SK Group is eyeing the mobility business as its new growth engine as the country's third-largest conglomerate will showcase its related technologies at the upcoming Consumer Electronics Show (CES). SK said Sunday its core affiliates ― SK Innovation, SK Telecom and SK hynix ― will set up a booth together at the CES, scheduled to be held in Las Vegas for four days from Jan. 8 to 11. This is the first time for the group to participate in the world's largest tech fair. With the group joining the exhibition, the upcoming CES show will feature Korea's four large conglomerates including Samsung Group, Hyundai Motor Group and LG Group. SK said it is not decided whether its chairman Chey Tae-won will take part in the show. 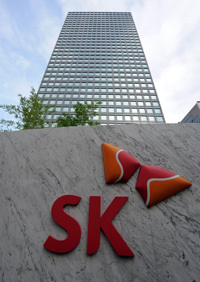 With a theme of "Innovative Mobility by SK," the group said it will showcase its capabilities in the mobility business. It said participating in the CES will become a chance to produce synergy between affiliates. During the show, SK Innovation, the group's energy affiliate, will introduce batteries for electric vehicles (EVs), an energy storage system (ESS) and lithium-ion battery separator (LiBS). EV batteries are a core component for EVs, which have shown a rapid growth. SK Innovation has expanded its investment in EV batteries. The firm recently signed a contract with Volkswagen Group to supply batteries for Volkswagen's EVs in North America and Europe. The firm has seen a high growth rate in ESS business. The ESS market has been growing steadily in markets where solar and other renewable supplies are high. Also, SK Innovation will showcase its competency in LiBS, a core component of lithium-ion battery. The firm has the world's second largest market share in this sector. SK hynix, the group's semiconductor affiliate, said it will showcase memory semiconductors for the automotive industry. As more vehicles are adopting IT devices, more advanced semiconductor specifications are required for the auto industry. Following the trend, the chipmaker will display DRAM and NAND flash products for technologies used in the automotive industry such as autonomous driving, advanced driver assistance system (ADAS), infotainment systems and telematics or driving monitoring technologies. SK Telecom, the telecommunication arm of SK Group, will display its single-photon light detection and ranging (lidar) technology, which identifies size and position of objects and give accurate surface measurements. The firm said the technology is the first result using quantum sensing technology of IDQ, a Switzerland-based firm SK Telecom acquired in February 2018. In addition, SK Telecom said it will set up another booth along with a local entertainment firm SM Entertainment. There, it will also demonstrate HoloBox, an artificial intelligence (AI) hologram device allowing users to talk to a digital assistant. Oksusu Social VR, a platform that combines virtual reality (VR) technology with the firm's mobile video streaming platform Oksusu, will be displayed as well.